Letchworth Village: sounds like the name of a pretty New England town, or perhaps a new condo development with all the latest amenities. It’s neither. Letchworth Village is a blot on the history of New York State, certainly a black mark on the state’s treatment of what we now call marginalized people. Located in Rockland County and opened in 1911, Letchworth was a residential institution for the mentally and physically challenged, adults as well as children. It was built on 2,600 acres of woodland and fields and, at the height of its existence, had 130-plus buildings and more than 4,000 patients, and was touted as the ideal place for the mentally challenged to be. It was anything but. Rumors of mistreatment circulated. Not only were the residents exploited to “benefit the state,” as the Head Psychiatrist’s report from 1921 implied — he advocated that “idiots” not be accepted because they could not do the heavy work (e.g., loading coal, building roads) to which the “morons” and “imbeciles” were assigned — but they were also used for medical experiments, including otherwise untested polio vaccines four years before the Salk vaccine trials began. Overpopulation was a problem already ten years after the facility opened. In 1946 photographer Irving Haberman made a set of photos that first alerted the outside world to the appalling conditions — the filth, overcrowding, neglect — in which Letchworth’s residents, especially the children, lived. Then in 1972, Geraldo Rivera included a report on Letchworth in an ABC News documentary that focused on a similar institution on Staten Island. This report eventually led to extensive reform of disabilities services throughout the USA but had little immediate effect on conditions at Letchworth. Letchworth was permanently closed in 1996. Today it stands in ruins. A few buildings have been recycled for other uses. The others may well be demolished sooner rather than later. Meanwhile, they and the adjoining cemetery stand as silent, accusing testimony to 85 years of state-sponsored gross maltreatment of vulnerable people. 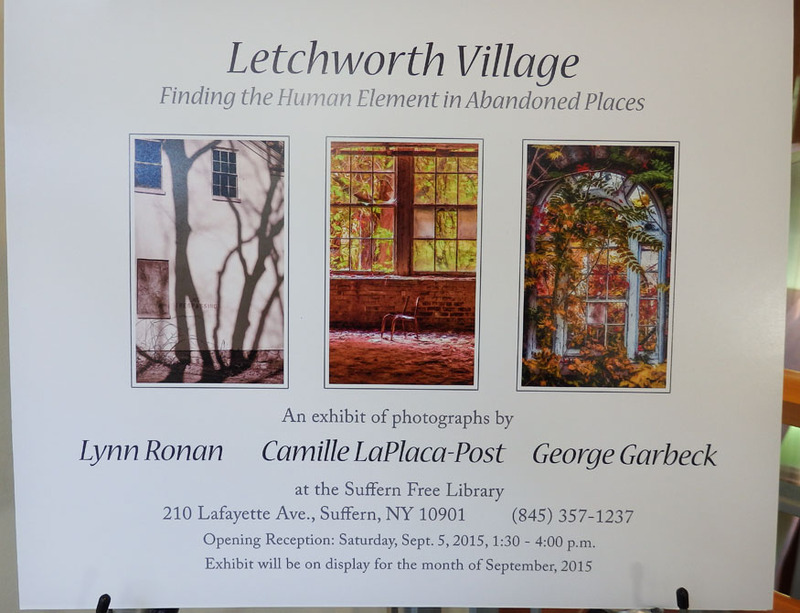 are now presenting them in an exhibit titled “Letchworth Village: Finding the Human Element in Abandoned Places.” Those of you who are familiar with my work know that this sort of subject matter is right up my alley, but I’ve actually never been to Letchworth. 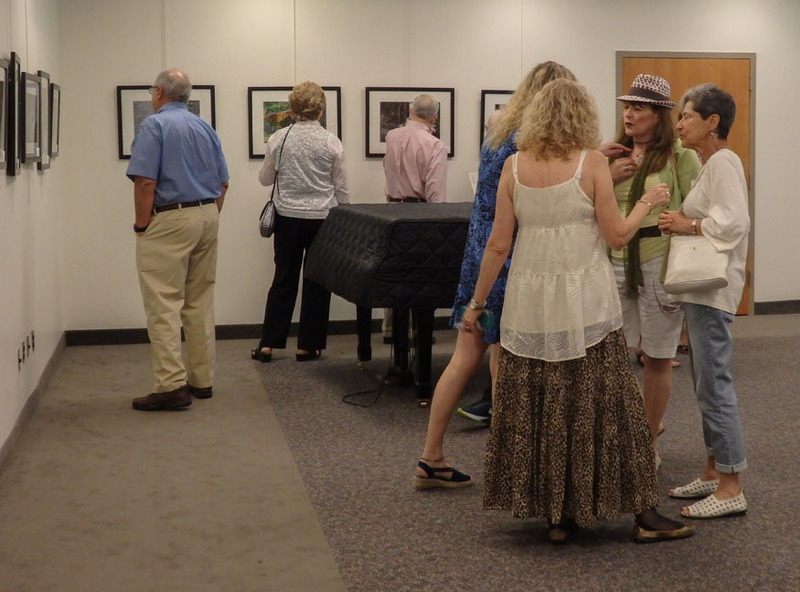 Having gone to the opening reception for this exhibit yesterday, I can say that viewing these photographs is as intense an experience as actually visiting the site. 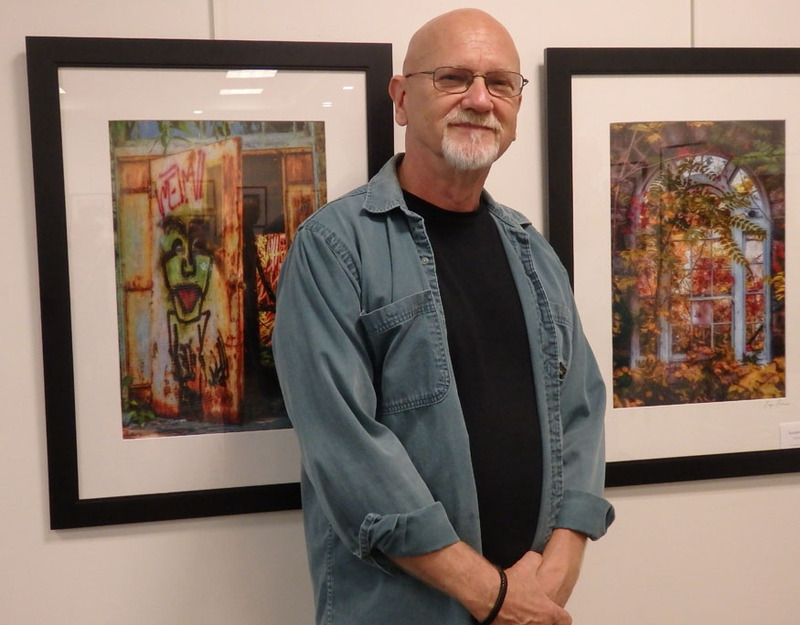 The photographers — Lynn Ronan, Camille LaPlaca-Post, and George Garbeck — are all members of the prestigious Ridgewood (NJ) Camera Club. Each has a uniquely personal way of responding to and interpreting the “human element” in this abandoned place — or, perhaps I should say, more than one personal way: What impressed me most about the exhibit as a whole is that each photographer captured different aspects of the subject matter and, in the postprocessing, interpreted the image as s/he saw fit, whether color, black-and-white, or infrared, whether tending toward the documentary or the very creatively artistic — and yet it all comes together; there is still a unity about it in which a response to this place called Letchworth Village is uppermost and the individuality of each photographer serves that purpose. It’s moving, chilling, and appalling all at the same time. I’m hoping to return and see it once more at least. 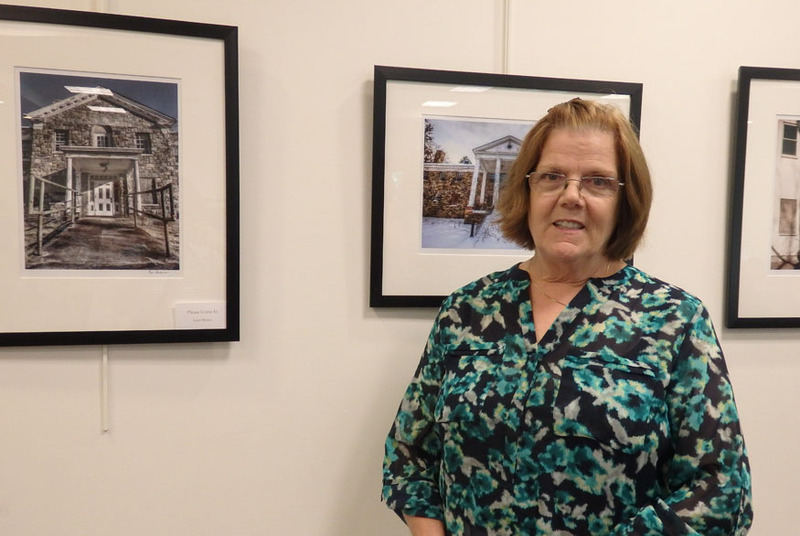 “Letchworth Village” is on exhibit at the Suffern Free Library, 210 Lafayette Avenue, Suffern, NY until the end of September. Lafayette Avenue is the same as Route 59, and the library is on the left if you’re going east. Click here for opening times. If you’re anywhere near the neighborhood, absolutely don’t miss this exhibit. I stopped by to see it, and am glad I did. The three photographers were able to artistically capture a part of our history that might not physically be there much longer, but should never be forgotten. Their work will help assure it won’t be. We viewed the show on Saturday and it was superb! 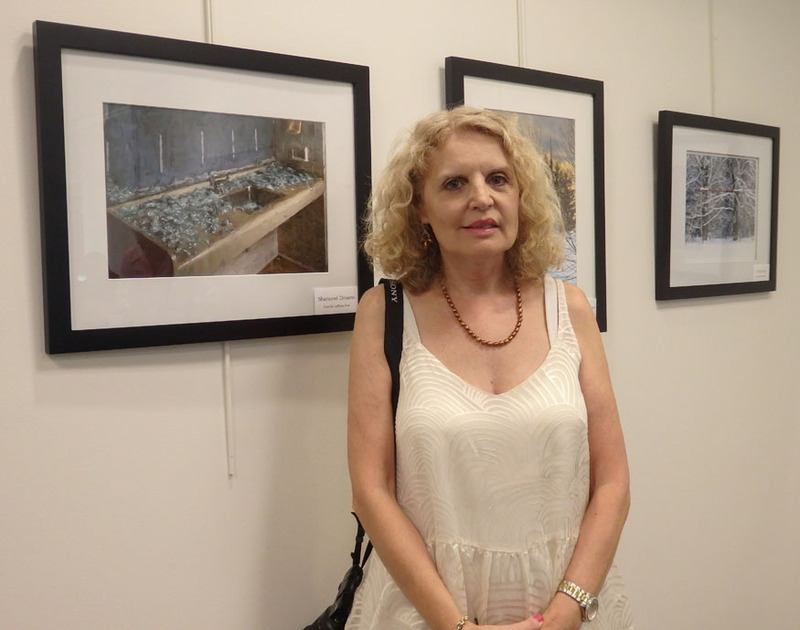 The photographs are wonderful and beautifully presented. They, in fact, tell a compelling story! Many thanks to the photographers, Lynn Ronan, Camille LaPlaca-Post, George Garbeck and Lynn Ronan. This only goes to show how important it is to photograph our community. Photos can make a difference. Looks like a great exhibition. Although emotionally loaded such terms as Cretin, idiot, and imbecile were actually a medical diagnosis. ‘In 19th and early 20th century medicine and psychology, an “idiot” was a person with a very severe intellectual disability. In the early 1900s, Dr. Henry H. Goddard proposed a classification system for intellectual disability based on the Binet-Simon concept of mental age. Individuals with the lowest mental age level (less than three years) were identified as idiots; imbeciles had a mental age of three to seven years, and morons had a mental age of seven to ten years. The term “idiot” was used to refer to people having an IQ below 30. IQ, or intelligence quotient, was originally determined by dividing a person’s mental age, as determined by standardized tests, by their actual age. The concept of mental age has fallen into disfavor, though, and IQ is now determined on the basis of statistical distributions.